The Dresden traditional dining collection reflects highly decorative double base with oversized claw feet, shaped top and decorative carving on apron. The dining chairs reflect carefully selected woodcarving and tapestry fabric in a symphony of material. Matching china & buffet reflects all carefully selected design features as the dining collection. 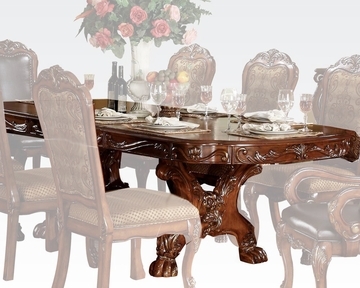 This collection will be the showpiece of your dining room environment. Established in 1985 in California, Acme Furniture Industry Inc. has been dedicated in providing customers with value for money products while maintaining high quality standards. With the capacity to ship 90% of the items requested, Acme Furniture ensures that customer satisfaction is meted out without compromising on quality. Located in New York City, New Jersey, Atlanta, Miami, Dallas, and San Francisco, Acme Furniture Industry Inc believes in maintaining deep rooted customer relations by offering only the best quality products at unbelievable prices.